I was on a cruise with my family in 2008 when my parents took my niece and nephew to swim with dolphins on a Carribean island. I remember thinking, "I want to swim with dolphins, too!" but my brother and sister-in-law and I were going to go on a rum tour of the island instead. A few years later when I watched the 2010 Academy Award Winner for Best Feature Documentary, "The Cove," I was glad that I hadn't gone to swim with dolphins that day. Dolphins in aquariums and swim with dolphins programs are taken from the wild in Taiji, Japan, in brutal drive hunts during which most of their family is killed while the young, pretty dolphins are taken in to captivity. They are then starved and force-fed dead fish, which a dolphin would ignore in the wild. Dolphin trainers from all over the world come to buy the dolphins, often spending as much as $150,000 for each one. Selling wild-caught dolphins is big business and is entirely fueled by humans paying to see dolphins in aquariums or to swim with them while on vacation. Dolphins are amazing animals. They are smart, self-aware, and social beings that have tight-knit bonds with their families. I understand wanting to get close to them, but I don't want to do anything that supports captivity or those brutal drive hunts. Luckily, there are ethical ways to see dolphins in the wild. 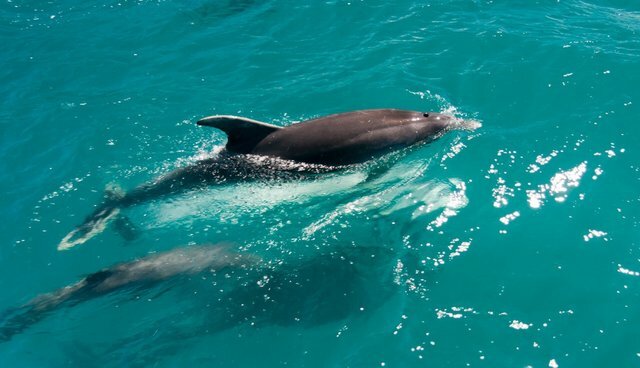 On Marco Island in southwest Florida, there is a National Geographic recognized eco-tour called The Dolphin Explorer. It's a long-term study of the bottlenose dolphins of Southwest Florida. For about $60 per person (with discounts for children and seniors), you can go out with a captain, a naturalist and other dolphin lovers to see dolphins in their natural habitat, feeding on fish and frolicking in the wake of the boat. Participants get to help identify the dolphins based on naturally-occurring marks on their dorsal fins. And if you see a new dolphin, you get to name it. These eco-tours are not the only thing The Dolphin Explorer does. They also rescue (and release) dolphins that need help due to things like entanglement injuries. It was thrilling to see the dolphins jumping behind the boat. Even baby dolphins joined in the fun! I've seen videos of dolphins doing this, but to see it with my own eyes was a dream come true. I didn't think it could get better than that, but then it did; a four-year old female dolphin named Jing Jing came up to the side of the boat and was looking right at me! Seeing dolphins was great, but making eye contact with a dolphin is an incredible experience, one I will never forget. Finding an ethical eco-tour is easier than ever, thanks to the internet and social media. If you want to see dolphins in an ethical manner, you can. And I promise you, it will be worth it.